So, with no pressure, except for self-inflicted expectations, what have Thunder done? Only come up with their best album since 1992’s Laughing On Judgement Day. It all starts with the title track, which is about turning aspirations of being a rock musician into reality. This theme is repeated on When The Music Played. The difference is that the former is about forming a band, and living the dream, while the latter is a wistful look at the golden age of 70s rock which influenced the Londoners in the first place. Both of these fit into the early Thunder musical format, being tight anthems. And so does the rousing The Thing I Want. However, there are some surprises here. The Rain has a country rock flavour, while Black Water nods towards the first Foreigner album, with hints of The Kinks. And The Prophet is reminiscent of Heart’s Barracuda riff lashed to Led Zeppelin’s Immigrant Song. The Zep theme continues with Chasing Shadows, which sounds like it’s been distilled from many sessions listening to Led Zeppelin IV, yet successfully avoids imitation. The raft of quality doesn’t dip when the pace is slowed for the smokey Broken, predicated on a forlorn piano sigh, allowing Danny Bowes’ vocal to shine. 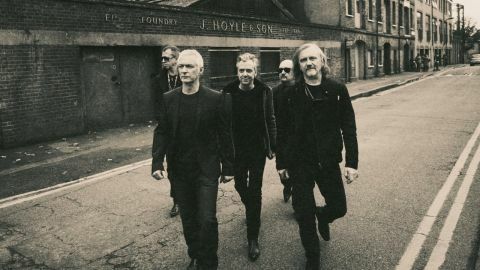 Serpentine, meanwhile, makes you think of Humble Pie, before it all ends with the torrential I Love The Weekend, which is an all out rock’n’roll blaze that will doubtless be a climactic tune live. Some of Luke Morley’s guitar work is brilliant, adding lustre and shine to songs which gives Bowes the platform to offer a towering presence, with the entire band gliding smoothly through the gears.